Covered warrants allow the holder to buy or sell a specific amount of any financial asset ( both call and put warrants exist) from/to the issuer ( a financial institution), at a specific price and on or before a specified future date. Investor pays an initial amount (like a regular option premium) to buy a warrant certificate. Used when investor seeks leveraged exposure to an underlying. Used when an investor wishes to hedge their existing exposure e.g. buying a covered put warrant on existing long position in underlying. Higher liquidity than traditional warrants, and the issuer has the obligation to always act as a counter party to quote a bid/ask price whenever an investor wish to exercise their rights, thus no liquidity problems for the investor. 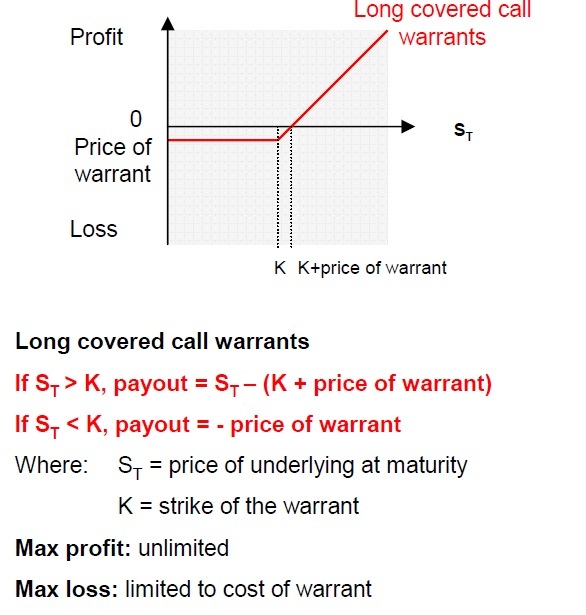 Cost of warrant is commonly low, thus offers a viable option for private/retail investors. No stamp duty (tax level) to pay. Highly geared and leveraged, potential large gain from little initial investment. Enable investor to gain exposure to movement of a range of underlying assets and trade profitably in both bullish and bearish market. Can be used to hedge position exposure.